What’s that spider on my ceiling? In North America, the two species of Cheiracanthum that you may find in your home are C. inclusum and C. mildei. Searches on the Internet (and sometimes in the scientific literature) reveal that these are commonly referred to as “yellow sac spiders“. 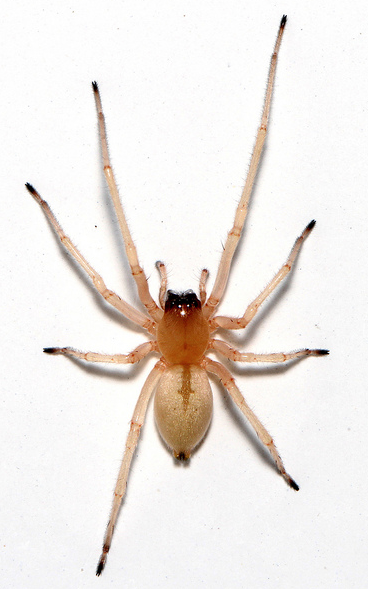 This common name is largely a hold-over from when Cheiracanthum was previously within in the family Clubionidae, which are all commonly called “sac spiders”. The yellow part obviously refers to their cream-like colouring. Personally, I think that “ceiling spider” is a better common name, because that’s where they are very commonly found. Almost every house that I go into has Cheiracanthum tucked away up in the ceiling, and I think most Arachnologists would support this claim. This means there you are most likely living in very close association with these spiders every day, and that they are likely distributed across most of (populated) North America. The million dollar question: do they bite humans? Any of you that have been following my blog will know my opinions about spiders biting humans. I argued previously that spiders bites are exceedingly rare, and attention should be paid to more likely causes. By the way, that previous post has received a lot of attention, and I was rightfully accused of using a provocative title. It’s true – I did use that extreme title on purpose, in part because I feel it important to contrast the incredible volume of misinformation out on the Internet about “deadly” spiders. Next time you are watching that lovely Cheiracanthum wandering around on your ceiling, just remember that it’s not a real threat to you, and it is fun and fascinating to watch. It is catching annoying flies for you, and providing some natural biological control in your own home. Keep them around! Cheiracanthum have a lot of helpers, also: I have documented a about ten different species inside my house over the past few years and I’m sure you have a similar diversity of house spiders, if you look hard enough. I’ll have to write about a few more of those species sometime in the future. Stay tuned! To learn some more facts about ‘venomous spiders’, visit Rick Vetter’s site or this site from the Royal Alberta Museum. Excellent post, Chris. Great photos too. ;o) I should probably have pointed you to two other blog entries made last year about this spider. Mine is short and says little more than yours does (http://spiderjoe.com/images/2). Eric Eaton goes into a bit more detail (http://bugeric.blogspot.com/2011/06/spider-sunday-longlegged-sac-spiders.html). In particular, read the comments of Eric’s post. We got into a brief argument about whether these were “house spiders” or not. It appears that these spiders often take residence in people’s houses in the northern states, and that they are mostly C. mildei in this case, but that in southern states it’s possible that they are more often just accidental visitors and more likely C. inclusum. There isn’t much data on what’s happening in southern states, but that seemed to resolve the discrepancies in our observations. Thanks, Joe – for the comments and links – i very much have a more “northern” perspective on these two species, and you are quite correct in that they are also found outside, BUT in houses is where people really tend to “bump” into them. And, in my neck of the woods, my own identifications seem to suggest that mildei is more common than inclusum -but the sample size is low. Those posts also link to some of the good fact sheets out there – I should have also referred to them (oops!). I just wanted to reply just for the sake of sharing my personal information regarding my experience with this species. The bite on my leg is just now almost gone, and was roughly the size of a quarter. It took about 11 days to heal. I treated it on the first day with a paste of baking soda and vinegar to pull the venom out. Then today, whilst pulling down my curtains in my bedroom to clean, low and behold the culprit pops out. A ‘ceiling spider’ as you call it, which I agree is very fitting! I have spotted these spiders in my house for as long as I can remember, (we live in a very woodsy area). I do recall one chilling experience, however, that urges me to not only fear them, but also dislike them. Many years ago, I spotted one crawling up my wall close to my bed…at the time I was a curious and bored teenager, and decided to attempt to burn the spider with a handheld lighter. Oddly enough, when I went to touch the flame to the spider, it jumped right on the lighter! This shocked me, so I dropped everything, and he got away. Now with that said, would it not beg the question that when threatened, this species would act aggressive in defense? Let alone bite when threatened, let’s say by an unsuspecting sleeping human? With my experience, I would not condone ceiling spiders to live in my home. I was just waken from a sleeping pill induced slumber by a burning/prickly sensation on my elbow that was extending over the edge of the bed (not in sheets). Looked at the elbow in the mirror and saw a welt form before my eyes, with red radiating from it. Not a feeling I’ve experienced before. It didn’t take long for me to blame it on the spider I left where it was on my ceiling just before going to bed, as I didn’t see it anymore. But then after a few minutes I did find it on the ceiling, further from where it was before relative to my bed. I suppose I should apologize to the spider, but it wouldn’t appreciate the gesture as I have since captured it to identify. I suspect it is the same as other spiders I’ve seen in here that I think come in through the hvac closet. I live in Canada near the US border. I was wondering if it was the brown recluse as warned against on spider bite posts, but I’m fairly certain I’ve identified the one from my ceiling as a female yellow sac spider. I haven’t been able to find the likely suspect in the area of my bed. As such, I’m a little concerned about turning the lights off to go back to sleep. So here I am making things worse by googling spiders. Interestingly, I had a dream (unpleasant one) about spiders infesting my home a couple nights ago. 4am…must sleep! I’m not sure there’s an animal on the planet that wouldn’t leap into the air when burned or try to defend itself with mortally threatened. If you’re sleeping and happen to roll over onto a spider and the spider thinks it’s about to be squished and die, it’s going to bite something in an effort to change its circumstances so that it might continue to live. I agree, I think the main point I was trying to get across with my story is that allowing certain spiders to flourish in your home is not necessarily safe. Especially if you have children. This was mainly in response to the last paragraph on the post, encouraging people to ‘keep them around’. I would rather them stay outside where they definitely belong….it’s too dangerous for them to be hanging around most humans anyway! Yes, it can be dangerous for spiders to hang around some humans. lol! Many spiders that you find in the house would prefer to be outside, but some spiders have so become associated with human habitation that it’s not clear where they originated or whether they can survive outside. C. mildei may be one of those in the more northern latitudes. And agreed: young children and spiders don’t mix, except in the case of web-dwelling spiders whose (wandering) males are too small to inject much venom. I’m sure that is the species. I’m in Pennsylvania, and as previously mentioned in a few posts regarding this type, you can definitely see evidence of them in any house you go to! Now since we are on a roll here, I have a curious question for you…..are you familiar with the Hacklemesh Weaver or Callobius? I stumbled onto this post while searching for that species because a male had wondered into my house last night, and I was identifying him. Are you aware of their fang size? Oh my! They are roughly two centimeters long! I was so fascinated, and actually thought he was poisonous at first. I have him in a breathable container and plan on releasing him far away from the house, but I never realized how big they get! I’m so used to seeing them balled up in their webbed sacs. Hi everyone -sorry for the delay in replying to this string of comments. In short, yes, you need to be ‘aware’ of spiders in your home, and in some cases children and spiders do not mix – but by in large, spiders in our homes keep to themselves and tend not to interact directly with us. My advice – know what you’ve got, get rid of them if you are not comfortable with having spiders in your home, but otherwise, don’t worry too much – again, just be aware. Indeed, Adrian! I think spiders do a lot more ‘natural control’ in our homes that what we realize. I would be most curious if anyone has done a study on this topic. I personally don’t mind spiders in the house, even these little yellow guys though i know that their bite is capable of causing an unpleasant array of symptoms. In this house no animal that comes in, be it spider, insect or mouse, is kill by me or my boyfriend (my mother is another story). They’re just doing what animals do, wandering, looking for food and a nice place to stay. 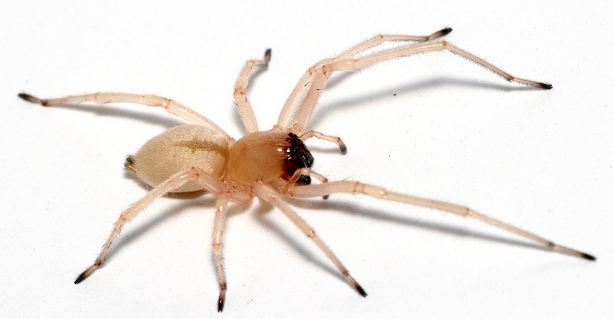 I like this article on the sac spider because it sheds light on how rare a serious bite is. We’ve had the black-footed ones in our house for years. Most of the time i gather them into a jar and take them outside. Simple as that. So to all those who think smashing a bug is the answer, well, jars are a better answer. Then you don’t have to kill something that doesn’t even know why it’s so hated or why it’s being murdered. I just wanted to say thanks for the post. It helped me identify the pretty little fella on my ceiling. I live in Bulgaria, which is in southeastern Europe. I was surprised to have the same species here. I know this is an old post, but I was curious if it was common to have a lot of them around? We’re in a new home and we’ve seen over ten in the past week. We typically introduce them to some toilet paper and redistribute them via flush but it seems like most people mention 1 or 2. Thanks for posting the info about these spiders. I won’t call them pretty though. I have been bitten several times while sleeping. Face, arms and legs and scalp. Both my husband and I were bitten two nights ago. He, on the cheek and me, on the leg. I don’t think there are many reports of bites because the bite is small, the culprit is hard to find, and the bite is nothing like a brown recluse. Secondary infections have developed on me also. But they do BITE! However today, my cat found the bugger on the bed. I introduced him/her to a tissue but it’s body fell off before I could even pick it up. My bite is small, redness larger than a quarter and hurts. I will live. We have a lot of these spiders outside in our Silver Maple tree. Their coloring is yellow to almost white. They are a problem when they get in our car too. Thanks for your comment – indeed, as I have written, spider do sometimes bite, but it is extremely rare, and I wonder if, in your case, something else is the culprit. The spider under the bed is certainly not necessarily the same one that allegedly bit you and your husband. reading this article after my daughter just caught the soider red handed, she killed it crawling across her back, and i was able to identify it as the yellow sac spider. She is using an ice pack right now on three welts on her back, which keep getting larger. I will probably take her to the doctor tomorrow as she is in some discomfort, similar to a bee sting or yellow jacket bite. You now have a reported case, or will have one when I take her in tomorrow. She is 16 and sleeps on the top bunk, maybe closer to spiders than normally, which is why she got bit? I have not seen a bite from these common spiders in our home, but here is the first I guess. Will be calling the exterminators since we live in Northern Calif where we live with a lot of varieties including black widows. Thank you for your post. It helped me a lot! Is it common to have a lot of sac spiders in your house though? I spot about 10 per day, every day. Sometimes even a couple walking across the wall, a few on the floor, and one or two chillin’ in the corner of the ceiling. They love those ceiling corners. I’ve been seeing these little guys in my house since I moved in over 2 years ago. Once I read your post, I’m pretty sure these are yellow sac spiders because of their color, black-tipped legs, and painful bites. I was bitten by one of these on the side of my foot while lying in bed, and boy did it hurt! Felt like a bee stung me and a fire ant bit me at the same time. The bite didn’t get infected or anything like that. It was a tiny red bump which went away in a week or so. Anyway, if you happen to know if there can be a large population of them in a house, the info would be much appreciated. Thanks for your informative post. My wife got bitten while sleeping. On a finger. Guess she felt it wandering on her hand and squeezed it while moving her hand. It was a mildei, as she still had the remains in her hand. Bee-like stinging, part of her hand and finger got swollen for days and it did not fade away. She saw a doctor who looked at her as if she was an idiot, but gave some benadryl-like medication, and the hand got swollen for another week. Meanwhile, as I happen to have an inspection binocular, I found the fangs still in her skin. So yes they DO bite! Apparently they do like the smell of gas, as Mazda issued two recalls because of them invading their cars. Thanks for the comment – I personally think they find their way in largely because of temperature (i.e., those kind of environmental factors/cues) rather than pheromones, but this is speculation on my part! I’ve certainly heard about the Mazda recall, but have trouble with the concept that the spiders are attracted to the smell of gas – I think in that case, also, it’s a combination of environmental cues and architecture. Thanks for your reply Chris. And congrats for your web pages! I live in the Montreal area too, I do not recall seeing these critters 10 years ago. Are they in an “invasion” phase, as it happened with earwigs some 30 years ago? I can only hope that their numbers will balance with other lifeforms over time. It is hard to determine if temperature or smell lures them, as both happen together in our case. Looking at the TV in a low-light room, it happened more than once to see one walking down a wall right besides me. Heat, CO2, bad breath? One of them landed right on my head once. It makes one wonder why. Their genome tells them to follow their lunch. Other small lifeforms also follow heat, CO2, smells. Besides putting some mesh or open cell foams in apertures, I found no way yet to keep them out. At the same time our house has almost no other visible little occupants. I leave alone the spiders that make webs, as they are more predictable, but it’s hard to like these yellow hunters. We have a Ford and a Mazda, and we do find much more mildeii walking on and in the Mazda. I am really out of explanations for this. Perhaps two or three times in my 65 years, I have risen in the morning to discover one or two atypical insect bites on my face or arms. Unlike a mosquito bite, these were half-dollar sized red areas that were raised, somewhat numb, and itchy. Plus, they seemed to linger for several days. The first time it happened, my father told me it was a spider bite. He looked around the back of the bed headboard and the ceiling, and sure enough, there was a quasi-clear spider at the top of the wall to which he attributed the bites. In fact, each subsequent time such bites have occurred on me, or someone I knew, we found the same type spider in the vicinity, such as behind the headboard or where the wall meets the ceiling. In all cases, the bites did not recur in the days and weeks following disposal of the spider. Now, perhaps it was just a coincidence that the presence of the spiders was discovered following the bites, but I will continue to periodically check behind the headboard and up and ceiling before I go to bed at night. In fact, I have not suffered a putative “spider bite” since I began doing that several decades ago. We have had the same spider living in our kitchen for almost 2 years. He isn’t seem to often, but occasionally I will spot him on a wall or I will find a web up in a corner. I’ve had many chances to remove him, but I I would rather keep him so he can eat the house centipedes that I dislike much more than him. Thanks for the info. I always wondered what type of spider he was and if he bites. You are welcome! I’m so glad the post was helpful. I have been bit by this sac spider myself. I know because I killed it as it bit me. It hurt alot, was right on my elbow. The initial bite burned for hours, and was extremely itchy, for weeks after. The healing wound took a good 3 weeks to heal. I now have fear of these spiders as I know the bite. They are all over my house, I have killed 3-4 in one day, in all different rooms. We also have black widows show up some times, but I fear them much less as I haven’t encountered an agressive one yet. I usually scoop them and put them outside. But these sac spiders have to go. I think I might hate them. Thank you for this informative post, and specifically information about bites. I awoke swatting away something crawling on my shoulder, followed by a horrible pain as if I had been stung. It still hurts half an hour later and is red and swollen. Thank goodness I found the guy curled up in my bed and your site to identify him! Now I can rest knowing it isn’t something more serious.